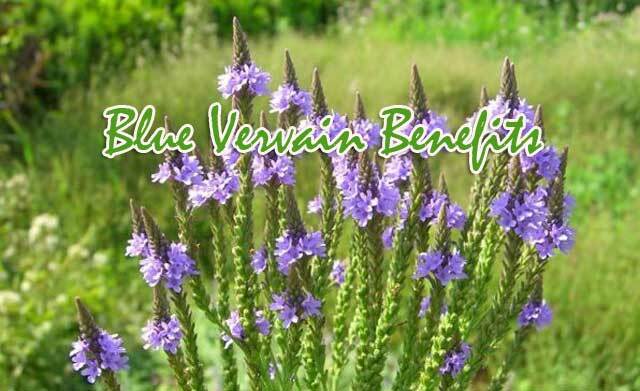 Blue Vervain Benefits – On this occasion we will share the health benefits of blue vervain. Among the famous benefits are stimulating the liver, removing toxins from the body, calming nerves, decreasing depression, reducing inflammation, relieving pain, boosting immunity, and reducing congestion in the chest. Before we see the benefits of blue vervain, let’s see what is blue vervain? This plant is small and you can find it easily in North America. Its has a purple flower which is called blue vervain. Blue vervain is a plant that is resistant to drought. The plant with the scientific name “Verbena hastata” is very strong against natural hardness, it is resistant to life in dry climates so it is regarded as a reliable herb. Blue vervain has been using thousands years ago, not only in America alone, but also the Romans take advantage of blue vervain as an herb. Now, vervain flowers are widely used as natural ingredients in traditional medicine. Part of the blue vervain that consumed is root, the flowers are made as tea. Blue vervain has great benefits thanks to its acid and phytochemical content. Blue vervain is made as tea as a natural remedy to overcome respiratory problems, bronchitis, colds, sore throat and congestion in the chest. The Romans to California have long used herbal tea vervain to overcome cough, colds. Thus, vervain also serves as an expectorant that serves to remove mucus and phlegm. Furthermore, the health benefits of blue vervain are as diuretic drugs that can remove toxins from the body. The diuretic properties will move the bladder to increase the frequency in urine removal. It will help remove toxins from the body, excess fluids, fat, and salt. Not only that, blue vervain also helps protect the kidneys, and liver by reducing the buildup of toxic substances in the liver and kidneys. Another health benefit is to treat bladder infections. It has long been known as vervain as a potent remedy for bladder infections. System plays an important role in maintaining the stability of body functions. The soothing properties in the blue vervain can provide benefits for treating neurological disorders, chronic anxiety, sleeplessness and stress. The unbalanced release of hormones can lead to various health problems such as those mentioned. Consuming a cup of blue vervain tea can provide calm to the nervous system and stimulate hormone balancing. The health benefits of blue vervain are also associated with depression and stress. Herbal ingredients from the blue vervain can soothe the mind, evoke a positive spirit, trigger the release of dopamine and serotonin. It also improves mood, and eliminates the worries in the mind. Parasites such as worms are enemies for our bodies, they attack and deplete the nutrients in the body so that the worms suffer will be thin. Blue vervain tea is useful as anti-parasite. Mean, it can prevent the development of parasites, and the growth of parasites in the intestine. Blue vervain is excellent as an herb for women who have severe menstrual problems. Health benefits of blue vervain is to reduce cramps, discomfort during menstruation and relieve menstrual symptoms. Vervain tea will regulate hormones and balance them. Tea from vervain flowers also beneficial to maintain your oral health. The presence of tannins in vervain tea can treat bleeding gums, bacterial infections, mouth ulcers, and others. The function of tannins is as an antioxidant that helps healing and preventing the ugliness of health.